Leslie from the lovely blog Gwen Moss took advantage of the golden hour of photography (the first and last hour of sunlight) and shared a magical tour of her garden. The sunlight is just beginning to stream through the tress. Can't you just feel the warmth and the quiet calmness of morning! Leslie has an incredibly lush green garden highlighted with mostly cool shades of blue. 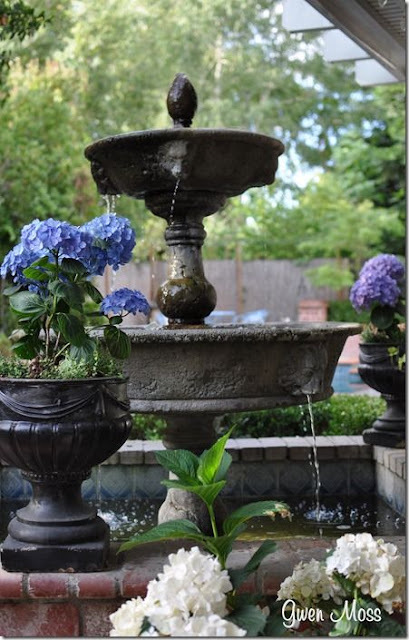 The water feature is charming and the sound of water creates a comforting sound for Leslie and her family! 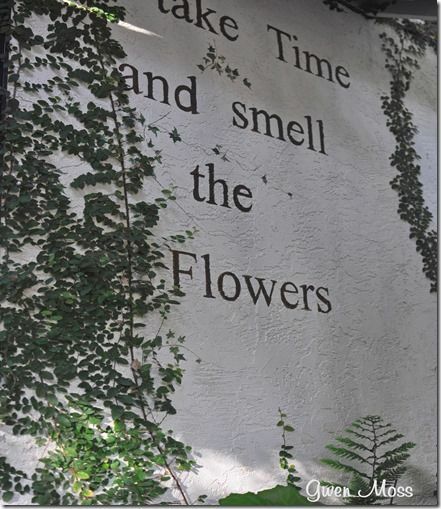 And this wall mural serves as a gentle reminder to take time and smell the flowers - simply charming! 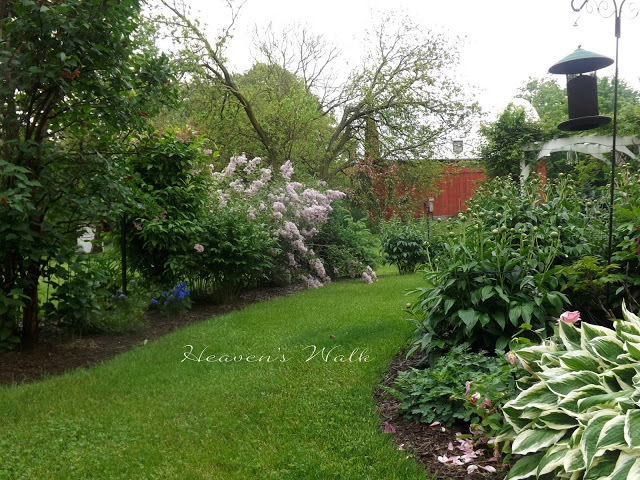 Laurie from Heaven's Walk has the most beautifully layered garden! 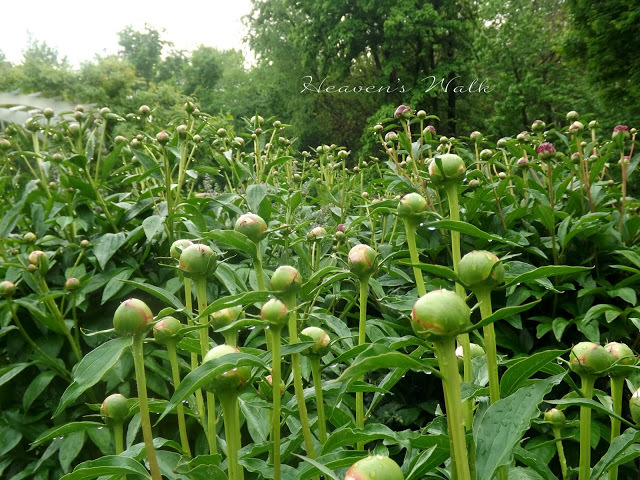 These peonies must be gorgeous in full bloom! The curves make you want to keep exploring. And do you see the red barn in the background? 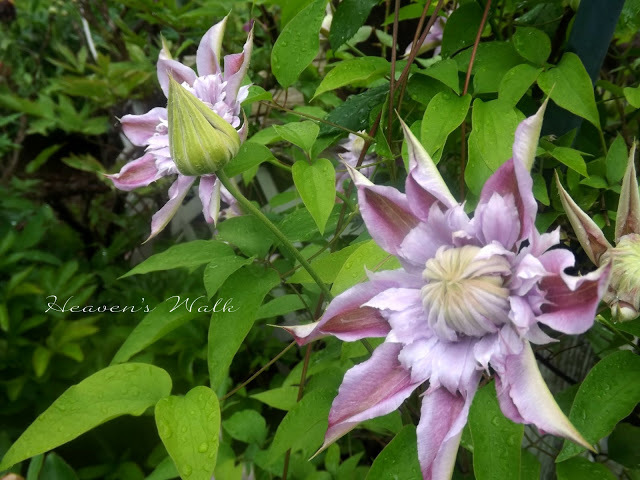 This is a gorgeous variety of clematis! And just imagine being serenaded by this little guy and twenty of his buddies every evening! Jen from Don't Mess with My Tutus created a wonderful rustic buffet for her back porch. I love the shuttered doors and the beautiful aged finish Jen achieved. How perfect for entertaining! 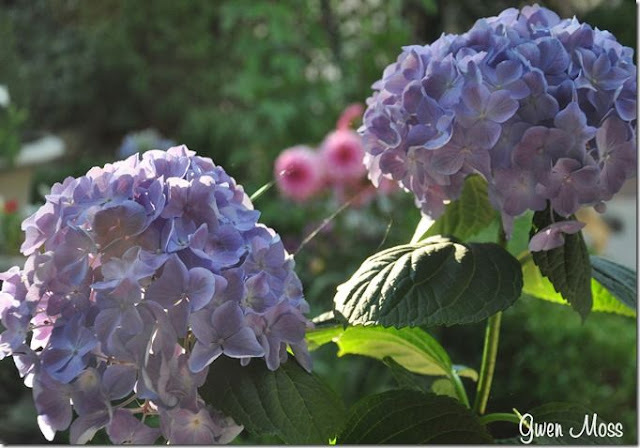 Thanks so much to everyone you shared their garden inspiration with us in June! Now on to this month's party. I'm not big on party rules, so let's keep it simple..
*Link up any outdoor/garden related projects you'd like to share - what's growing in your yard or garden, patio gardens, landscaping ideas, garden furniture or décor and of course we love porches, patios and garden parties! *We'll start a new party on the second weekend of the month and share features throughout the month. Feel free to link up as often as you like. And it's okay to link up the same project to our Garden Party and our Be Inspired Party held every Tuesday. 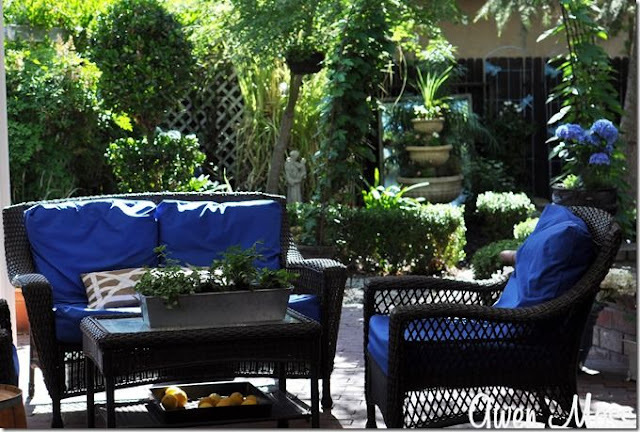 I can't wait to see what's happening in your outdoor space! 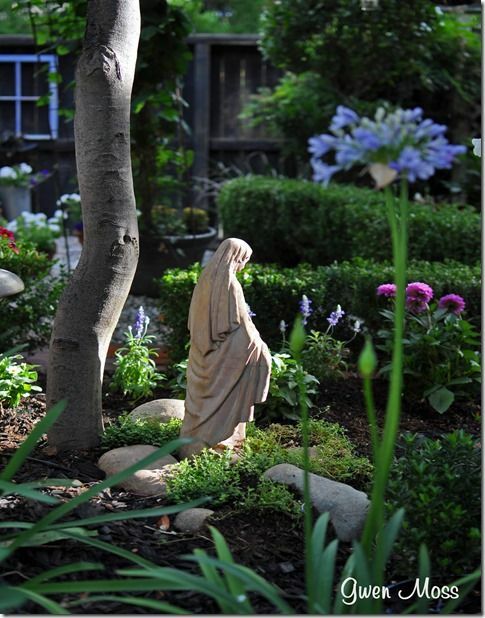 These are beautiful gardens! I can imagine how relaxing it is to sit out there early morning and evening. That buffet is great as well! What gorgeous photos! Will have to check out her blog! 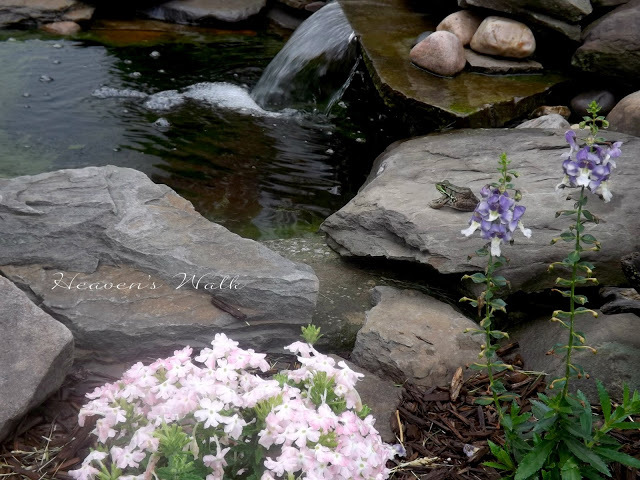 What a nice surprise to see my garden featured here Sharon. Thank you so much for the kind words. 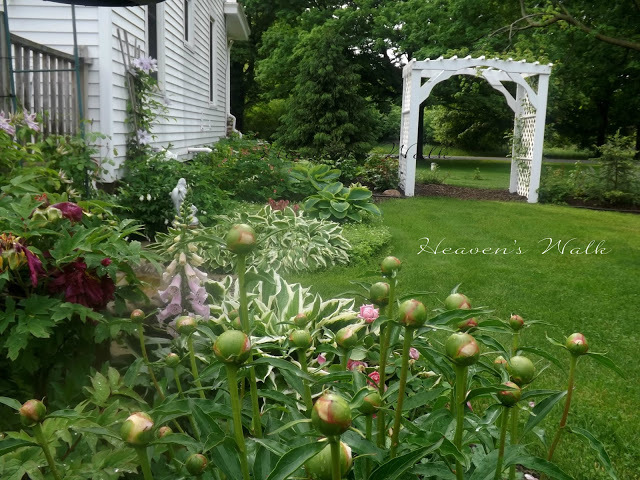 This is one of my favorite linky parties because I love getting inspiration and ideas from lovely gardens. And that buffet is one of my favorites. I must have done the link wrong, my garden isn't in the thumbnails! I guess I'll try again for next month! All these are beautiful and what inspirations! All these beautiul spaces make me want to go out and dig in the dirt!!! Thank you for the garden party I can't wait to go visit and see all the pretties that are shared each month. Have a wonderful day. Woooohoooo! I finally got it done! So happy to be here, Sharon! Thanks for hosting your INSPIRATIONAl garden parties! Very Best Tag Sale Moment EVER! Legs, the long and short of it!